Hi, my name is Lynsey and I love all things relating to the pelvic floor! So much so I am getting one tattooed on my leg! I am also in awe of how powerful women are. There are so many strong and wonderful women out there. 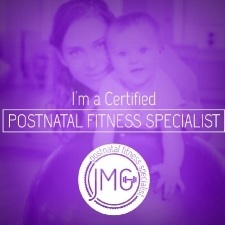 Anyway I am qualified personal trainer and I specialise in working with women who are looking to get pregnant, are pregnant or mums (no matter how long you have been a mum). Even though I worked in the fitness industry I didn't realise the damage I was doing to myself and it was difficult to come to terms with the fact that a lot of the damage I did was by rushing into exercise again and if I had only known to go see a Women's Health Physiotherapist and complete some rehab I would be in a different position. So my mission here is to create a space for women (you) to navigate your journey into motherhood armed with all the information so that you can make informed decisions on the best way to get back to the exercise you love, or if you didn't exercise before to help you find something you love. I want to make sure that you can protect your pelvic floor, heal any Diastasis Recti and generally feel stronger to smash your life as a mum and a woman. Thank you for joining me. I really hope I can make a difference. Hi, I’m Katie and I’m the Thelma to Lynsey’s Louise. I am the gal behind the scenes running all things social and technical. I am a mama of two boys, a fan of 80’s movies, mildly obsessed with the colour pink and a self confessed foodie. My background is sales and marketing which sounds like the least exciting thing ever, but when I was off on Maternity leave I turned my hand to blogging and channelled my slightly boring business skills to something more creative. Through this I met some incredible, mighty women and forged wonderful friendships. One of those women was Lynsey and from that friendship grew a realisation that we could also build a business together, focused around our strengths and beliefs. Balancing out Lynsey’s amazing coaching skills, I look after our website, blog and social media pages as well as planning events and engaging with the press to share our empowering message. As a huge advocate for self care and body positivity I am really keen to create an on and offline community for women, especially mamas, that is positive, inclusive and fun.